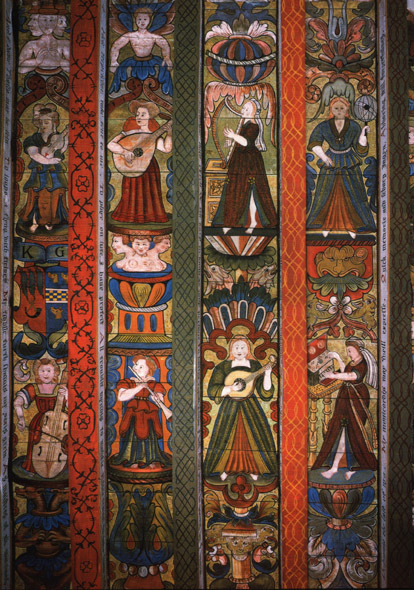 Renovata Cythara - Plucked, fretted instruments in Medieval and Renaissance Scotland. Determining exactly what instruments were played anywhere during the medieval period is never an easy task. One writer's gittern is another writer's cittern. And poetic imagery may be just that - a product of the imagination. But the earliest mention of guitar-like instruments in Scotland come from two of Scotland's finest medieval poets, or makars, Thomas of Ercyldoune (1219-99) and Richard Holland (fl.1450). According to the ENCYCLOPÆDIA BRITANNICA, ''a gittern is either of two medieval stringed musical instruments, the guitarra latina and the guitarra morisca. The latter was also known as the guitarra saracenica. The guitarra latina, an ancestor of the modern guitar, usually had four strings and was plucked with a plectrum. Early drawings and the sole surviving example (c. 1300, Warwick Castle, Warwickshire, Eng.) suggest that the flat, waisted body and the neck and pegbox were carved from one solid block of wood. It was probably developed in Spain, spreading thence to France, England, and Germany, and was played as late as the mid-17th century. The guitarra morisca, a pear-shaped cousin of the lute, was popular in Spain from the 12th to the 18th century. However, not all scholars agree with this description, with some citing a surviving example by Hans Oth of Nuremberg, dated about 1450, which as more of a resemblance to a lute than a guitar''. Welcome to the world of medieval organology! There are far more opinions than there are players. Of instruments the onely king. 'Gittyrnis gay' and 'Githornis maist jucundious', allowing for poetic alliteration, gives some sense of the role and style of music played on the gittern. It was most likely a treble instrument used for sprightly division-style runs around a singer or other melodic instrument. Fractionis divide, at rest, or clois compel. From left to right we have some kind of wind instrument (not my strong point! ), a bray harp, a sythole, a lute, a viel, a cittern and ...a pizza! The latter apparently as much a feature of life-on-the-road for musicians of the 16th-century as of today. Almost all the illustrations and engravings from both the medieval and Renaissance periods show the sythole being plucked with a plectrum of sorts, and whose function was mainly to provide accompaniment for the voice, although solo and ensemble instrumental playing would also have been enjoyed. It is commonly assumed, incorrectly I believe, that plectrum playing in the medieval and renaissance periods implies single-note lines with maybe adjacent open-strings being played as passing drones. Whilst this sort of performance technique is certainly possible, and in many cases probable (there are still examples of it to be found in modern folk, rock and pop playing), it is important to keep in mind that counterpoint, the simultaneous playing of two or more lines, is also possible with a plectrum technique (it is possible, for instance, to perform J.S.Bach's entire cello suites and violin sonatas and partitas, almost entirely as written, on an electric guitar with a plectrum). 'Or to hear the sweet and delicate voice of cunning singers, intermedled with the melodious sound of Lutes, Cirters, Clairshoes, or other quiet instruments of that kind' - Alexander Hume (1556-1609)? The cittern in 17th-century Scotland seems to have been the same as the French model which had some frets 'missing', some only going half way across the fretboard, some only a third of the way across. It was therefore designed for playing in only one key, or two or three modes, and was ideal for folk-style playing. I recorded the earliest surviving Scottish cittern music - from the Millar/McAlman manuscript, c.1645 - on the CD Flowers of the Forest (Greentrax CDTRAX 155). The cittern was to make a dramatic comeback in the 18th-century as the 'guittar' (see later). ~ left to right: treble viol, bass lute, bray harp, pizza chef, bass viol, bell flute, cittern and portative organ. Although Holland is employing the typical poetic device of alliteration in 'the sytholis, the soft sytharist', he could equally have said 'the striking sytharist'. The fact that he chose the word 'soft' implies, I think, gut strings and a fingerstyle technique (with or without nails is impossible to say). In ensemble playing the sytharist, or guitarist, might have been expected to perform improvised 'divisions' of sung melodic lines — a common renaissance practice — and in solo playing, or in solo accompaniment to a voice, could easily have performed two or even three-part counterpoint. How to cite this page: MacKillop, Rob. "Plucked, fretted instruments in Medieval and Renaissance Scotland." Renovata Cythara: The Renaissance Cittern Site. Ed. Andrew Hartig. 19 July 2017. 19 April 2019. <http://www.cittern.theaterofmusic.com/misc/scotland.html>.